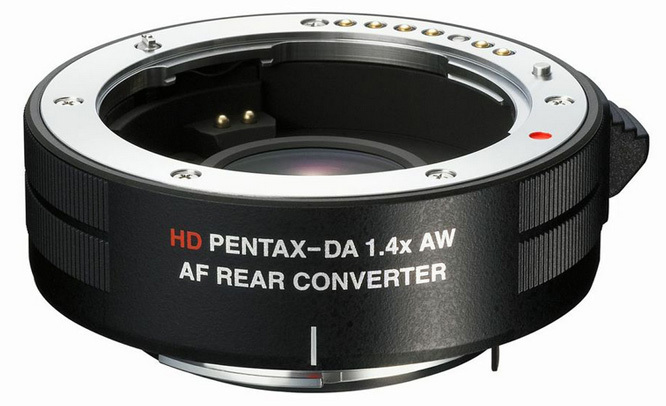 The The HD-DA 1.4X rear converter is the first Pentax converter that not only extends the focal length of the main lens by 1.4 times, but also accommodates the autofocus operation of the main lens. as these lenses might mechanically damage the converter’s lens elements. Whether such problem exists with some older lenses is not clear yet. When combined with an f1.4 lens like the DA*55/1.4, the open aperture of the combination is f2.4 (instead of f2) due to the limited diameter of the converter’s lens elements.